Happy Epiphany! I meant to share our usual chalking over the door this morning, but it's a weird day. The girls are headed back to school after the longest winter break we ever had, the windchill is below zero, and we're just... off. Sooooo, I'll share what we made this weekend! 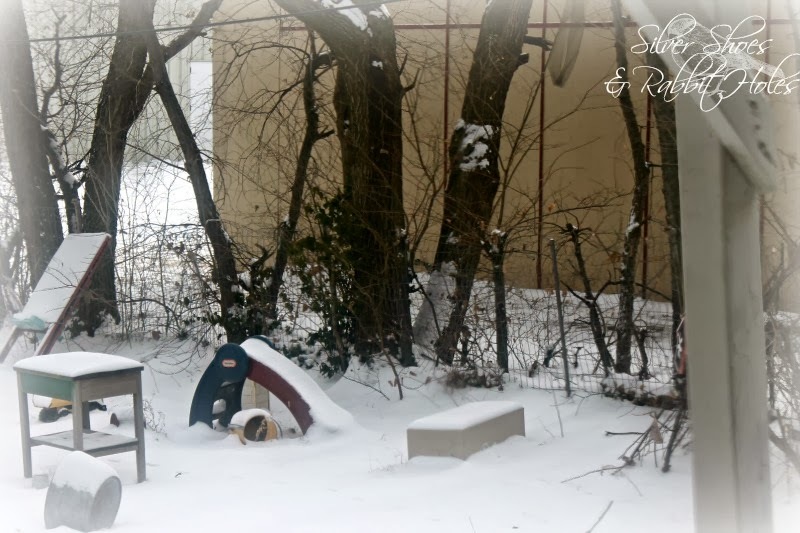 Taken through the back window. It's cold!!! How this project began: I started another Pinterest board last week. (I have too many boards, I know.) This one is called "Magical DIY Dollhouse Inspiration." 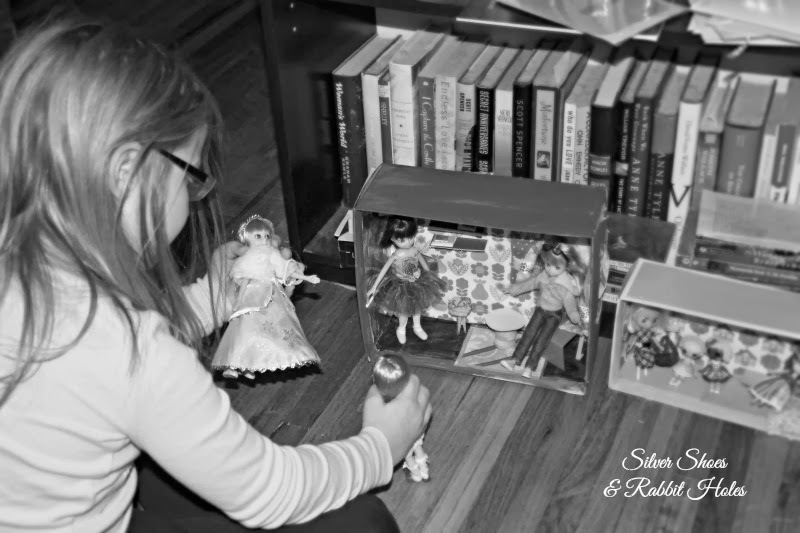 Mr. B and I have so much work to do on our real-life little dollhouse, now that the girls are back in school, but once we have their bedroom and playroom organized (and purged - shhh), we would love to work on a family dollhouse project. 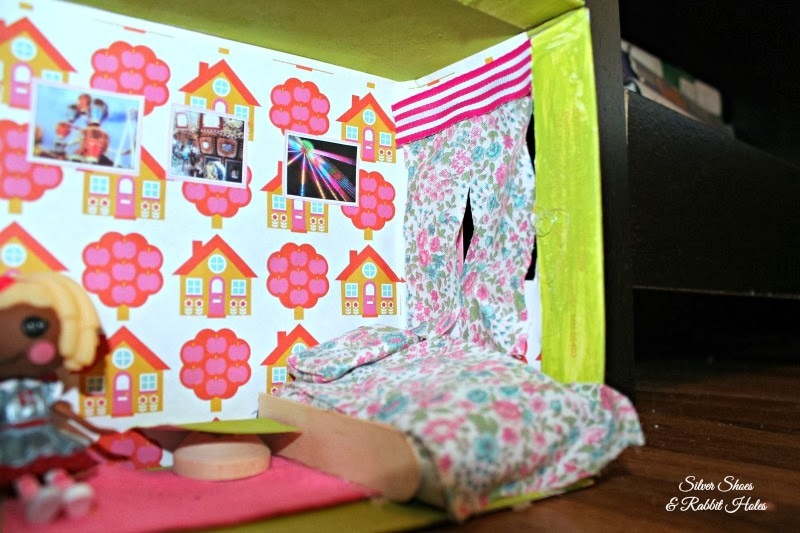 There are so many great ideas for making your own dollhouses, from plywood to cardboard to bookshelves to cabinets. (Please, check out my Pinboard!) It's going to take some time before we can begin. Most likely, it will have to be a summer project. Saturday night was cold and dreary. The snow was just starting. I have a huge supply of partially used craft supplies: fabric scraps, hot glue, scrapbook paper, acrylic paint, wooden sticks... Why not see what we could come up with on our own? 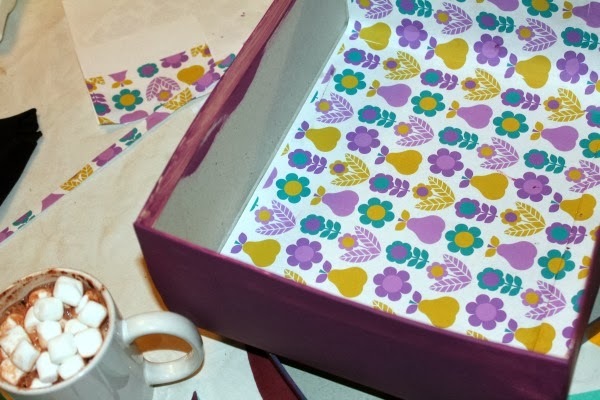 I started by painting the larger shoe box this pretty plum color. I wanted a cool retro wallpaper, and none of the scrapbook paper I had fit the bill, so I wound up buying this adorable Scandi Kids paper and accents kit designed by Alice Apple for Kitschy Digitals. The colors are great, and I could print more for future projects. After I painted the floor charcoal grey, I measured, cut, and pasted the paper to two walls. Then Big Sis and I had the idea to make a mirror for the third wall using aluminum foil. A lollipop stick became a ballet barre on that wall. (Big Sis wants a ballet barre to use at home!) I used an Exact-o knife to cut two windows, and cut out some fabric for curtains and hot glued them in place. The shelves are made of cardstock. I drew the ballet slipper picture. For the books, I cut the folded edge of the shoe box lid into book shapes. (The folded edge works as the spine.) The furniture consists of a modern chair made of brown cardstock and wooden stir sticks, a table made of stacked clothespin craft bases and cardstock, and a stool made of a bottle cap covered in batting and fabric, glued to a miniature clothespin. Everything is hot glued down. Maybe it's more like a cruise ship cabin than a house? Yesterday, we decided to tackle the smaller shoe box. This box was already pink and white, so the only painting I did was green on the floor, ceiling, and trim. 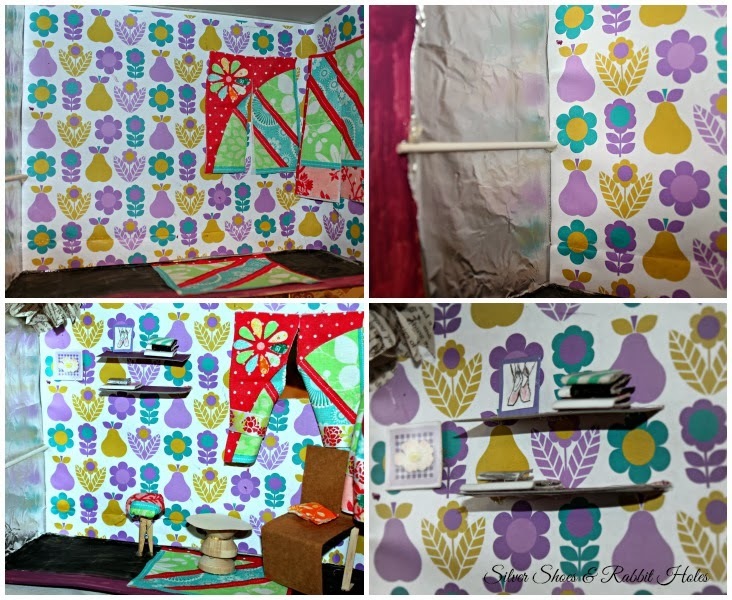 We used another Alice Apple Scandi Kids print for the walls, and made curtains out of scraps, with some ribbon as valances. The bookcase is made of cardstock. This time, the books are made out of scrapbook paper, folded into book shapes. The bed is made of cut tongue depressors, stacks of polyester batting wrapped in fabric, with extra fabric for the top sheet. There is another table, and the pictures are actual photos I took at the Wildwood Boardwalk in New Jersey last summer, printed postage stamp size. 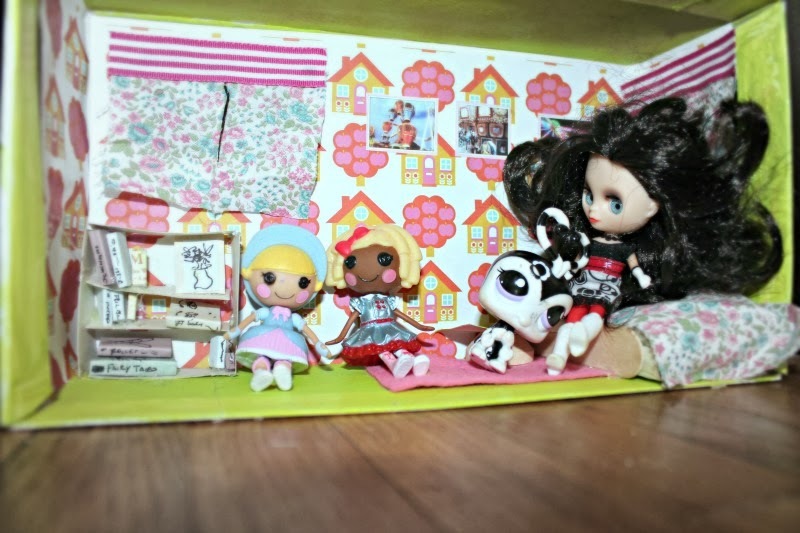 This house is the ideal size for the girls' Littlest Pet Shop Blythes and pets, and Lalaloopsy minis. 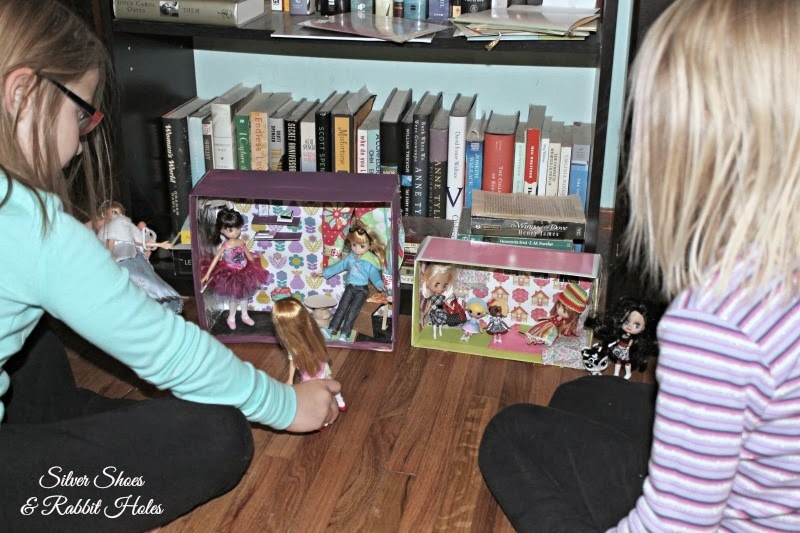 The girls received some Lottie Dolls for Christmas! My sister got them two each. Have you heard about Lottie Dolls yet? They are originally from the UK, and what makes them so great is that they are designed to proportionately resemble real nine-year-old girls! They wear no makeup, and are meant to be a realistic reflection of what real girls are like. (Read this!) I first read about them on Small for Big and I knew we would love them. Big Sis got Snow Queen Lottie and English Country Garden Lottie, and Little Sis got Spring Celebration Ballet Lottie and Robot Girl Lottie. There are so many cool dolls to choose from, though. Pirate Queen Lottie? Awesome!!! I kept myself preoccupied with dollhouse making and playing, while our Packers lost in the playoffs. Happily, we were done before the return of Downton Abbey. I love Carson. Do you love Carson, too? Happy Monday, one and all. Stay warm! Yes, I love Carson too! Lovely shoebox houses. I had heard of those dolls too but need to face the fact that my sons are never going to want one. Oh well. 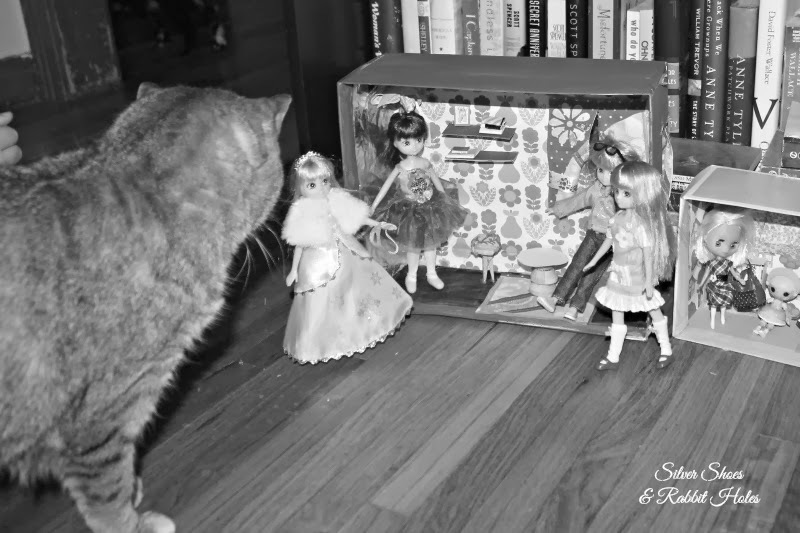 Your dollhouses frankly look fabulous! You got really creative using the stuff you already have! I love the improvised ballet barre and mirror! Quite a brilliant girl you have for thinking of it! 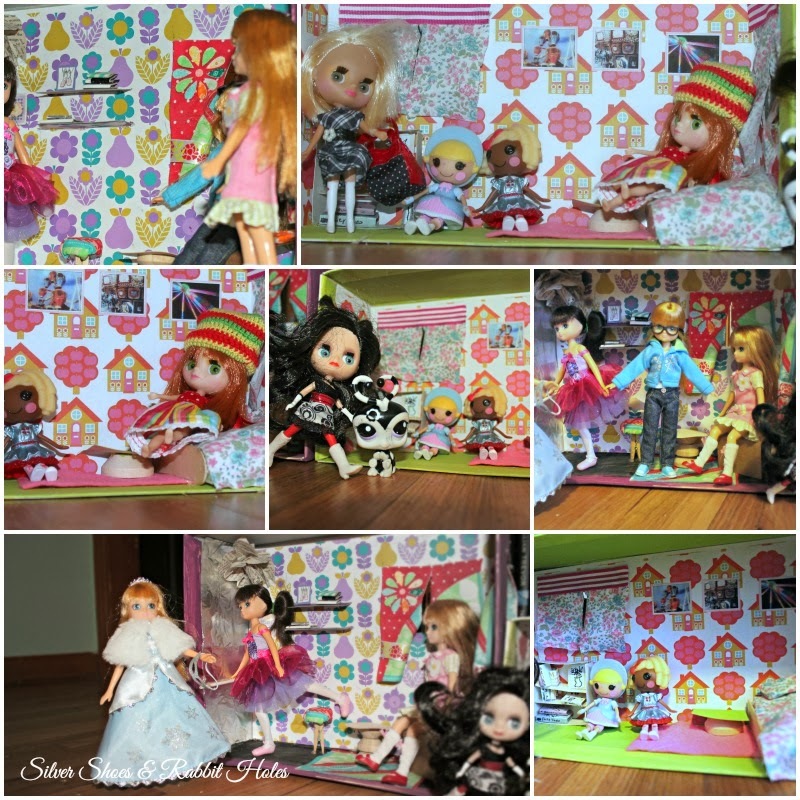 The Lottie dolls are ADORABLE ♥ I am totally sold on them after seeing your cute pictures! They are really cute, and thank you!!! I admit, I'm pretty proud of what we were able to come up with. Everything is hot-glued together, so it isn't fancy and it might fall apart, but no money lost! I figure it's practice. 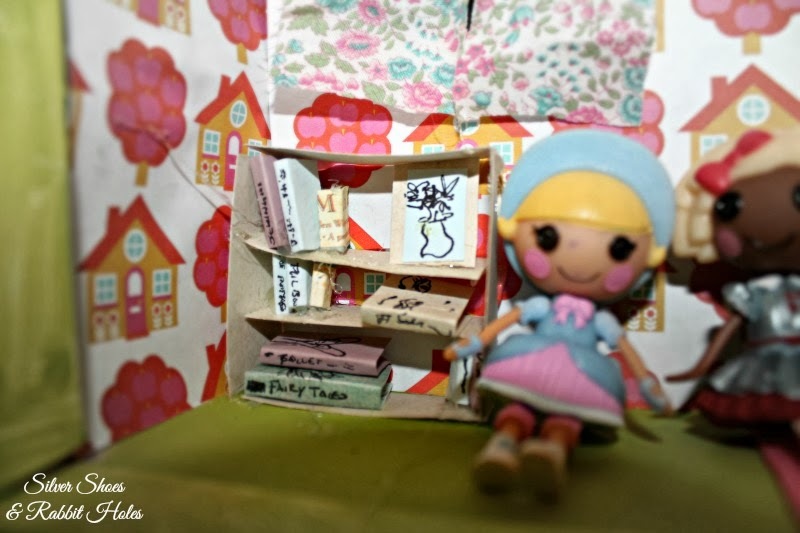 I really want to make one big dollhouse someday! WOW -- these are fabulous!!! I really want Lottie dolls too. they are so darling! i need a hot glue gun. really really i do! i am super impressed by your darlingness here, i tell ya. Oh Carson. I ADORE Carson! I have to wait till today to watch, b/c we get it via the pbs website and it goes up the day after it airs. Tonight's my night! SO excited! Oh, thank you! Hot glue guns are fun. If I could have found more glue sticks, I would have made a third house. Mr. B dug up an old shoe box with a folding lid that is crying out for a makeover. The Lottie dolls are adorable. Just so you know, Mr. B found Downton Abbey on the PBS Roku channel last night! It's under Masterpiece. I don't know how soon it went up, but it was there after the show aired on TV. The dollhouses are ADORABLE! Love how detailed they are, especially the books and curtains!! I didn't know about the Lottie dolls, they 're great and I'd really like some for us too. What a lovely alternative to Barbies, we actually have some Disney princess barbies and although I love them, somehow it doesn't seem right that they look so grownup. I agree. My girls have some Barbies (mostly my old ones), and they have the Disney Store versions of Merida from Brave and Elsa and Anna from Frozen, but I love the idea of little girl dolls for little girls. You can pose them, and they can even stand! (Some stand better than others.) Thanks for the compliments. I don't know if they will last long, or how often they will be played with, but they were fun to make!